The following two reports are post match and pre-match analysis for the OKC Energy FC. They’re currently in the Western Conference of the United Soccer League, a sanctioned Division II Professional League in the United States. If I was looking for an analyst – film matches, provide evidence of our game model, look for ways to improve our methodology and provide data per match-team-player and create a highlights section for players to watch online. Based on Grieve’s response, it is clear that a tactical analyst, at any level, can offer the head coach valuable insight into his own team and the opposition through a number of ways. He can alleviate the workload off the training ground and assist in improving the club’s weaknesses and approach. However, for this article, we’ll focus on profiling your own club’s tactical model (Energy FC) and creating an opposition (LA Galaxy II) analysis report. Obviously, it should be noted that the analysis below is not an official OKC Energy FC report, but they have been looked at by the manager and they consider it to be the type of work they’d expect from a tactical analyst. Note: To understand part 2, the opposition analysis of LA Galaxy II, you need to read Energy FC’s style and strategy model – part 1. 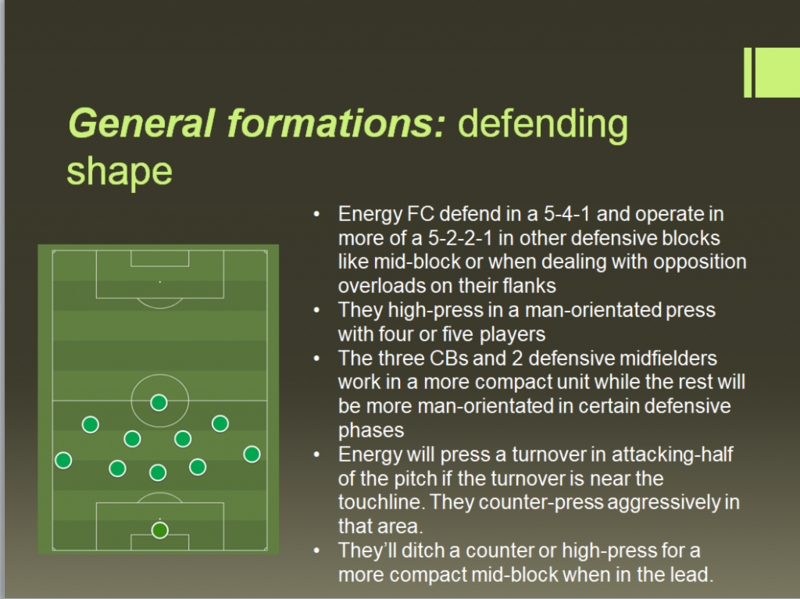 Energy FC, according to their coach Jimmy Nielsen, has recently undergone a formation and system change. They went from 4-3-3 to 3-4-3 (Hey, Antonio Conte, you made three at the back fashionable again). Anyway, they defend in in 5-4-1/5-2-2-1 and attack in more of a 3-2-2-3 in possession. The slide below explains their defensive characteristics. Oklahoma are a team that will high-press, but I wouldn’t call them a high-pressing team. Against Colorado, they implemented it for the first 30 minutes using a man-orientated press with four or five players. It seemed the objective was to force Colorado to go long. In non-pressing defensive blocks, Oklahoma uses a 5-2-2-1. They’ll revert to a compact 5-4-1 to force the opponent out wide and then that usually triggers a 5-2-2-1 man-orientated press with their two CM/DMs shifting the ball side to cause a defensive overload. Counter-pressing needs the right type of players and it usually works well with teams that spend most of the match with the ball, so they decide to spend their defensive energy winning the ball in their attacking-half when the opposition loses it. However, a counter-attacking system needs players with good endurance and pace and can be a bit tricky when dealing with good ball-playing sides. So, at the lower-leagues, most coaches opt to only use it when a turnover takes place on the wings or half-space. Oklahoma show their double-mark/passing lane sideline counter-press below. If I had to categorize Oklahoma’s attacking style, it would be possession-direct. Most of the possession is done by horizontal keep-away possession between the three CBs and two CM/DMs. Those five players will look to keep the ball and constantly look for vertical options to the other five players in more advanced positions. At times, it very much operates in a 3-2-5 with wide CBs and at least one DM looking for direct long balls to the wingbacks. They are a very direct team. Watch below. In Energy’s system of attack, the wing-backs are the key to offering width and are often the main points of penalty area creation. The video below breaks everything down. When Oklahoma are not looking for constant vertical passing options, they sometimes overload one side, draw the opponent in, and the opposite side wing-back cuts in centrally, parallel to one DM, and they’ll look to quickly switch sides. After that, Oklahoma’s three forwards start running forward in a very narrow shape while the wing-back looks to cross. After that, Oklahoma’s three forwards start running forward in a very narrow shape while the wing-back looks to cross. Against Colorado, the Energy’s direct style of attack led to some decent goals. I break it down below. In the modern game, transitions from defence and attack are growing more and more important to managers’ training curriculums. Why? Well, it’s growing harder and harder to score on defensive blocks when they’re safely able to set up. In transition, however, is when teams have less organized blocks, which means capitalizing on turnovers and counters are huge. Below, you can see how Oklahoma use rotations against Colorado in their transition from defence to attack and how creating space for the wing-backs is very important. Also, for more on rotation, check out Lee Scott’s tactical theory piece on it. – OKC Energy don’t really like to build through the middle through short, quick passing. – Most of their possession is done at the back with three centre-backs and two central/defensive midfielders. – The 2nd half saw OKC Energy turn the ball over more and make poor clearances. That, combined with Colorado’s more aggressive and expansive approach in the 2nd, saw the Energy lose their grip with some penalties against them. – Oklahoma are a very direct team that looks to create a lot of vertical options in both build up, transitional, and counter-attack phases. At the time of this writing, this opposition pre-match analysis was written for Energy FC’s July 30th match against the LA Galaxy II. The following videos below detail all the weaknesses and strengths in LA Galaxy II’s style of play and how clubs like Reno 1868 FC, Tulsa Roughnecks FC, and Portland Timbers 2 got the better of them. With that said, the opposition analysis videos below are broken down in a way that instructs all the ways Oklahoma can exploit the Galaxy II and why. Energy FC should seek to control the game. The best way to do this is a similar approach to how they faced Colorado Springs – possession-direct. Don’t get cute with the ball. Energy FC looked in control when they slowed down the play and built up and rotated for vertical long balls and options. Be careful where the Energy FC are ambitious with their passing. The Galaxy II are decent at counters. Don’t be afraid to launch plenty of crosses or play defensively. As with many teams at this level, transitioning from attack to defence is difficult – Galaxy are poor at this. Be careful about Tyler Turner when he’s coming down the right-wing or trying to link further up. He’s got good dribbling and pace. Don’t be afraid to use tactical fouls on him. When transitioning from defence to attack, use those same forward/wing-back rotations you used against Colorado, the Galaxy struggle at defending wide through-balls! More or less, this is what a post-match and pre-match would look like at the Second Division level of United States Professional Soccer. When it comes to these types of reports, it is sometimes the smallest of patterns and tactical details that can make the most difference. Furthermore, it should be interesting to see if OKC Energy FC approach the match in the manner in which I mentioned in my analysis and manager notes.